Need great recipes for your amazing vegetable garden? This companion book to the best selling gardening book ever tells you how to get the most out of your veggies! Mel Bartholomew, the author of this amazing book, began his journey as an engineer and only did gardening on the side. He used his engineer's mind to break through the frustrating process of trying to start a garden in small spaces. He is dedicated to the idea that you can yeild a high amount of food from a small space, as well as free of toxic chemicals. In this book he gives you 135 recipes for vegetables that are most likely to be grown in a typical garden bed, and although he says, " The most efficient way to eat vegetables is fresh and uncooked", he understands that taste has a lot to do with it too! Different areas of the book will also help to get you started on the road to vegetable heaven. The "Kid's Corner" has ideas to try and get those veggies in those small bodies, as well as his amazing tips for when to harvest, how to tell if you vegetable is growing correctly, and how much you can expect your vegetables to grow! 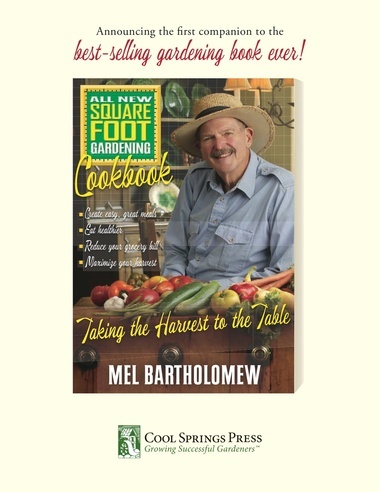 Buy this book and The Square Foot Gardening Book also by Mel Bartholomew and you are good to go for Spring. Oh, that is so cool! I love square foot gardening! I have tried it in the past, but don&#x27;t adhere to it strictly these days.... Probably should take a look at it again for efficiency in my small garden. And, I love new cookbooks and will have to check this one out! Thanks for the info!